Shopping for a wedding dress can be overwhelming. While some brides launch the process with their dream dress in mind, finding 'the one' is still a challenge. We've compiled some of our best tips and tricks for narrowing down your bridal gown selections. Finding a bridal dress is about personal style and trends, season included, whether they are affordable or expensive, it’s your big day, so make sure to have fun and never settle. Dress shopping starts with the silhouette. One of the most popular styles is the ball gown wedding dress, which has a full skirt, fitted bodice and a cinched waist. This style will define your waist and highlight your bust. If you’re looking to create a little extra curve, try corset bridal gowns to give your style even more drama. 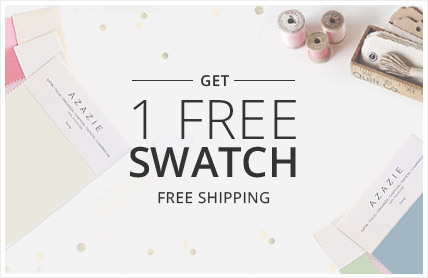 Plus size wedding dress collections are available, however nearly all Azazie dresses can be custom fit for all sizes. If you’re looking to elongate your figure, a tea-length gown is just the ticket. This design has a tapered skirt that flares out above the knee, to lengthen their figure. Also, an empire waist gown can also create the illusion of longer legs. If you’re a fan of clean lines, modest dresses will give you a chic minimalist style that you’ll love. The straight cut adds even more length to your figure. 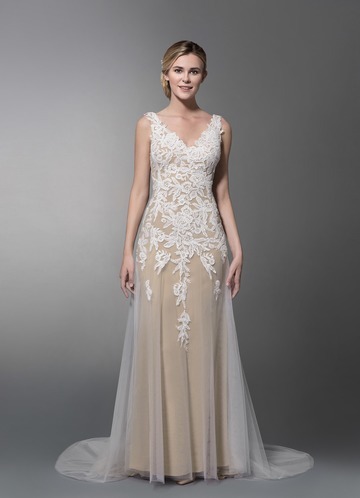 If you’re looking to highlight your hips, there are two fabulous cuts you should try: the trumpet style, which is fitted below the knee, and drop waist style dresses, which shows off your waist and hip area. The most coveted of all silhouettes is the A-line. The fitted bodice will showcase your waist to perfection and the skirt will flow softly in an A-shape from your hips. This classic look makes this a classic go-to cut for ball gowns. 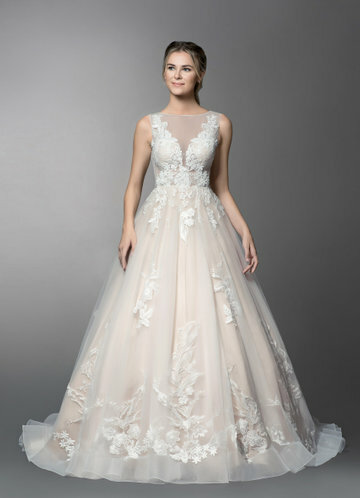 On your unique day, a majority of the photos will be taken from the waist up, making the neckline of your bridal dress the star of the show. A strapless, corset bodice is the most popular because it is so versatile. If you have a fuller bust, a simple bodice with a structured off-the-shoulder neckline is a good place to start. If you have a smaller bust, you can look for an embellished bodice or a sweetheart neckline to give it more emphasis. Also, a square or scoop neckline looks great on everyone. As for the hemline, it's all about personal preference. Brides who want to show off their legs can try short dresses, and if you’re excited about showing off your shoulders, try a halter neckline. More conservative brides can go for a dress with an illusion neckline. One of the most fun things to focus on, are the details on your dress. These fabulous accents will usually depend on the theme. If it is a vintage theme, featuring delicate lace detailing and cap sleeves will be great. 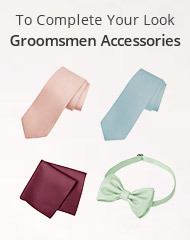 Unique elements like a colored sash is perfect for a modern theme. For bohemian theme, a dress with ruffle accents and a flowing skirt can give you a signature relaxed feel. A cocktail style is the perfect time to slip into a figure hugging gown with a deep V-neck. Another aspect to consider is your wedding venue. A destination wedding goes perfectly with a dramatic gown, such as the beach bridal gowns. Garden themes are perfect for dresses with whimsical details like tulle or lace overlays. Always remember not to go overboard with the embellishments. It’s important not to overwhelm your figure, and if you’re looking to create more curves, look for a chiffon dress to exaggerate your shape. Also, asymmetrical pleating and heavier embellishments are fun details for any bride who wants to give her look a modern twist. Bridal collections on the runway have been an eclectic mix over the past few seasons. 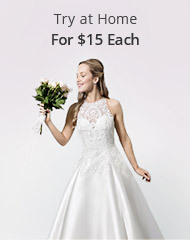 In addition to vintage dresses, highly embellished and off shoulder looks have been very popular, while other brides have been opting for sleek and minimalist dresses. 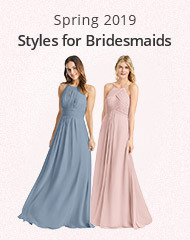 As for color, not only are brides saying goodbye to the traditional white dress and hello to blush colors, runway styles are also showing hints of blue, gray, and mint. Tulle has been a consistent winner for fabric, as brides are in love with romantic, light-as-air tulle skirts. Crop tops or two-piece ensembles continue to be popular and add a modern aesthetic to your happy event. Lastly, a major trend that's showing no signs of slowing down is the 1930s-inspired wedding dress. 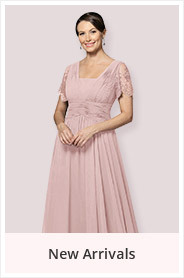 This elegant style features a sheath skirt, draped details, delicate embellished sleeves, and plenty of sparkle. We know it takes a village of your closest friends and family to complete your special day. 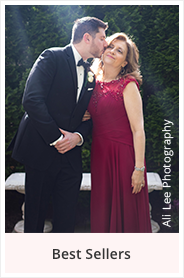 You can outfit the entire wedding party, starting with our stunning Mother of the Bride dresses that will make your mom feel like a queen, our vast collection of complimentary bridesmaid dresses for the favorite women by your side, and our groomsmen accessories to pull it all together.